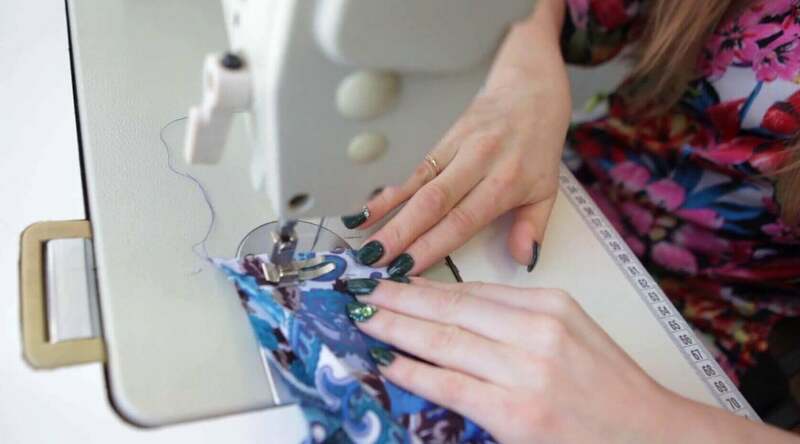 At Canvas Etc., we pride ourselves in knowing everything we can about our textiles. While there’s always much to learn, there are standard basic indicators of what makes a fabric special. So what is Cordura fabric? Since its creation in 1929, Cordura fabric’s utilization extends into various applications. It’s a synthetic (or sometimes a synthetic and cotton based blend) fabric that is strong and durable. It’s interesting history and unique qualities make it a high caliber fabric for a multitude of projects. We carry cordura style nylon fabrics for all your needs! Each of our cordura style fabrics come in various colors and tensile strengths. Whatever your undertaking, we’ll match you with the best nylon product. First of all, cordura fabric is a premium textile that’s use expands over 70 years. Originally created by DuPont, its first uses were for the military. It was initially classified as a rayon style of fabric, however its biggest use in World War II was for tire material. Funnily enough, Cordura’s initial classification of rayon was just known as a stronger form of the fiber itself. Scientists were trying to strengthen tire material by manufacturing stronger rayon yarn. After discovering alternative uses, Cordura nested into the nylon family. After 1977, those who manufactured the interesting fabric learned how to dye it. Dying the fabric allowed for the advancement of new products. The fabric lent itself to the creation of soft-sided luggage bags and eventually became responsible for over 40% of the bag market. That means more than likely, your backpack or duffle bag may most likely be made from a Cordura style fabric! Today, Cordura fabric is not only lending itself to backpacks and luggage, but also jackets and tactical gear. It’s fascinating uses are found within items like jeans and shoes. As a result, uysing Cordura-like fabrics increases the life of the product because of its amazing traits. All in all, this fabric has come a long way and has proven to be as versatile as its more natural counterparts. As mentioned, Cordura fabric was once classified as a rayon fabric. As its traits were finely tuned, Cordura became known as a nylon style fabric. This opened up the fabric to other levels of use. Since Cordura is a synthetic material, it’s built to last. It has high tensile strength fibers and will withstand long term wear. It’s highly abrasive and in most cases extremely water repellent. This means Cordura and Cordura-like fabrics are amazing for so many things. Limitless amounts of products and applications benefit from Cordura fabric. Not only will it work for you, it’ll work wherever you need to use it. Cordura fabric is additionally flame repellent. Per the regulations of the National Fire Protection Agency’s 701 guidelines to fabric flame retardancy guide, cordura style fabrics are inherently flame retardant. This makes Cordura and Cordura-like fabrics great for events requiring compliant fabrics. Certainly, cordura comes in various fabric weights and styles depending on certain applications and projects. Heavier weighted Cordura-like fabric is great for industrial applications. Lightweight Cordura style fabric’s versatility works well for all sorts of personal and professional uses. Over time, specific lines of the fabric were solely manufactured for the military. Now, all Cordura style fabric is available for use. These higher grade lines work well for extended outdoor use and extreme conditions. Overall, Cordura fabrics stand the test of time and the elements with confidence. Work wear: Cordura stands tough where other fabrics struggle to hold up. If you work in strenuous environments or laborious conditions, this nylon-based fabric will last through many washings and remain as durable as its first use. Tents/Outdoor Shelters: Cordura style fabrics like our synthetic lightweight tent fabric is water repellent and mildew resistant. Its breathability is ideal for liner applications in outdoor shelters including tents or yurts. It also comes in flame retardant varieties. Jackets: Cordura style fabrics including our ballistic nylon fabric has amazing abrasive qualities and can keep you safe depending on the weight of the fabric. The ballistic nylon works great for motorcycle and tactical jackets. Coverings: Our 1000 Denier Nylon Cordura-like fabric is expertly made with protection in mind. If you need a cover for outdoor furniture or a watercraft, its water and mildew resistant properties protect your outdoor products against all harsh conditions. Bags: As mentioned, Cordura fabric and luggage applications date back to the late 1970s. Whatever the load, this synthetic fabric can handle the baggage. Regardless of the project or use, Cordura style fabric works for your everyday items. Going the route of a synthetic fabric like Cordura fabric will ensure every variable it meets comes covered. At Canvas Etc., we proudly carry a large variety of high quality, Cordura style fabrics. 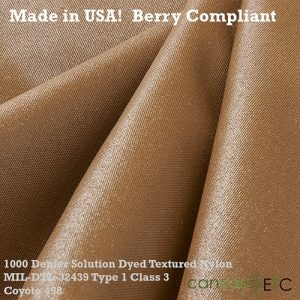 We additionally offer denier nylon fabrics for our commercial and crafting clientele. Therefore, whatever the necessity for your current or future projects, we’ll help you find the optimal fabric. Above all, we’ll always work hard to have the right textile for whatever your use! If you’re not sure what that may look like, our experts are standing by to assist you. Finally, we’ll point you in the right direction for what will suit your every need. Contact us today if you have any questions or would like more information on any of our products.